GRAY: My name is Gray Lesesne and I am planting a new Episcopal community in the suburbs of Indianapolis, Indiana, from the Diocese of Indianapolis. EMILIE: And I’m Emilie Finn and I am the pastor of a new Episcopal church plant in Surprise, Arizona. DEB: and I’m Deb Anderson and I’m a missioner with Emilie at that Episcopal Church plant. BRENDAN: And what is your plant called? BRENDAN: Ok. I googled it and I wanted to make sure I found the right place. Can we start by just giving me a summary of what you’re at least attempting to accomplish in each of your contexts? If you can tell me a little bit about when you started and what are the major steps that have happened so far? EMILIE: I was the associate rector at Advent Episcopal Church in Sun City West, and what they wanted me to do was to look at what it would mean to reach out to the community of Surprise, which is right next door to Sun City West. When I started talking to people and trying to figure out how to do that, one of the people I reached out to of course was Deb, who was the youth minister at the church on the other side of Surprise. What I quickly figured out was that these young families were not going to come to a church in one of the retirement municipalities. If people lived in Surprise, they wanted to attend church there. It would have to be an Episcopal Church in Surprise. So the more Deb and I talked – she had students who needed something in Surprise and I had adults who needed something in Surprise. The more we talked, the more we realized what we were talking about was how we might plant a church together in Surprise. DEB: We didn’t actually intend to do it quite as soon as we did. Just under a year ago – actually the end of July last year – we got together a little discernment team to see if this was even a thing. Two of these kids on the discernment team told us at our second meeting that, “We need something, and we need it now. Start it for the start of school and we’ll bring you a group.” And we looked at each other and said, “Oh my goodness. We have 10 days before school starts.” Lo and behold they brought us a group, so we started the church. BRENDAN: Okay, so “We started the church” sounds deceptively simple. What was the first step? EMILIE: We thought we were going to have to make some big argument for why we should be allowed to do this. DEB: We walked in and he greeted us and he said, “Good afternoon. 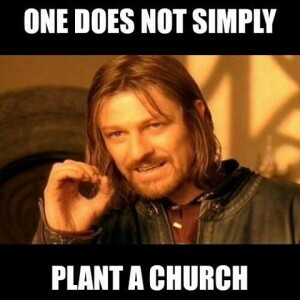 I hear you want to plant a church. How can I help you?” That surprised us. EMILIE: So we were fortunate in that we got permission to try things early on. My church was very helpful and loaned me part time to this new church plant, which is not usual. They’ve been so generous. DEB: I unfortunately had to step away from the group I’ve been with for a decade. I left them with a thriving group of leaders that had worked with me that I was confident in. So that was a challenge and a half on the personal front, but it also paved the way to do stuff with a new group of amazing kids. We were very fortunate that the diocese was also looking at some other options. You’re familiar with Susan Snook and the church she planted in Scottsdale. Building on that and some other interest from around the state, we happened to get into this just weeks before there was a church planting bootcamp planned. So we walked into that and one of the pieces of advice in terms of fundraising was to go to people you know. Emilie and I looked at each other, and I’m from Connecticut, and she attended Yale Divinity School. So we said, “Well everyone we know is in Connecticut,” and ended up taking this fund-raising trip and having lots of conversations, one of which ultimately led us to Tom Brackett, and onwards to Philadelphia. So we had a sort of a series of meetings to learn and make connections and go from there. We’ve had our share of challenges too [unintelligible] has been very positive. EMILIE: We’ve been having lots of conversations with Susan Snook at Nativity in Scottsdale. But one of the things we have found is that there is no one size fits all model for church planting. Because a lot of the things that would work in Scottsdale with the kind of demographic you have there – you know, more financially secure, type-A white-collar community – it’s not the same kind of community our demographic is. They’re different. They tend to be middle management and blue collar, less educated, certainly less wealthy. A lot of people in caregiving professions, a lot of people [unintelligible] poor. So a lot of our challenges are different from hers. So we had to sort of take her model with [unintelligible] sign on it. DEB: It should look similar – you know if you look at a map and you look at the number of households in a given area, etc. – it looks from a very broad view very similar. And what we’re finding on the ground is that landscape is not the only thing that counts. We’re roughly equidistant from the center of Phoenix but we’re very different. BRENDAN: So if we fast forward to where you are about a year in, what do the activities of Emmaus look like? DEB: We have a Sunday service from 4 to 5 that’s primarily for our launch team. We haven’t done a public launch of any service – its public in the sense that people can invite people, but it’s not public in the sense that we have any kind of grand opening. Then our youth group meets from 5 to 7:45 every Sunday. So we build on that. The rest of our time is spent out in the community. We just established office hours at strategically located coffee shops. So we have a service that is slowly growing, and we have a youth group that has pretty much remained constant. And what we have done with our youth and adults is that they are ready now to go out into the community. They want to grow the church, and they also wants to do outreach projects, which i think is the next step to actually grow the church. EMILIE: Well, we hope so. DEB: An outreach program and community forums to kick off the school year, specifically to hear the voices of the kids, the teenagers, to hear what their challenges are given the events that have gone on our country, and the fact that we are demographically so different. What are the issues? What we found is – it seems like there are plenty of options in Surprise. We’re the home to four mega churches, but the kids are looking for something more traditional and intellectual. EMILIE: And liturgical. They come back from places like Radiant, which is the biggest megachurch. It’s 18,000 on a Sunday. So they’re huge, and our kids come back from going places like that with their friends, and say, “Well, that was a great concert, but it wasn’t church.” So we’re trying. It’s a little foreign to the community because [liturgy] is so old, and this is an 18 year old community that doesn’t have any of those kinds of things built into it. So in a sense it’s kind of odd to try to build a “new old” church in a new community that doesn’t understand old things. But the kids love that. The kids are almost desperately seeking something that has roots, that goes deep, and that goes far back, that has been there before they were here and will be here when they’re gone. DEB: As a case in point, our first meeting with the kids after the initial discernment meeting, we had them put their cell phones in a pile and did a reflection with them that led them from cell phones to wanting to discuss [unintelligible] because their world is so confusing and chaotic. The follow-up conversation to that – one of the 12 year olds pulled me aside and said, “Look what I really want – I’m on my phone 24/7 I use it to escape from everything. When I’m not comfortable I open up Facebook or whatever is there. What I need from you is to teach me how to calm down, and how to pray, and how to be part of my own life.” This is a 12 year old. BRENDAN: Yes, that’s a challenge for me as an adult, so I can only imagine when you’re 12. EMILIE: I mean it is a challenge for us as adults, but these kids have grown up with it from day one so they’re navigating a whole different kind of world. There’s a sort of generation gap between boomers and millennials and it shows up in interesting ways. It’s almost like the boomer generation had so much reality that they needed entertainment and escape, but these kids have so much entertainment that they don’t have any reality. They don’t have anything real and meaningful and so they’re looking for the exact opposite of what their parents are looking for. They’re looking for real and meaningful and specifically not entertaining. DEB: They want beauty. They don’t want things handed to them. they want to go do and and be part of and know. EMILIE: But they don’t know how to do that. They have to build practical skills. BRENDAN: So, Gray, you’re also operating in a suburban context. You’re much earlier on, but from being Facebook friends with you, this idea of strategically located coffee shops seems very familiar, because I see you check in a lot. Can you talk about what you’re doing and how it’s similar and how it’s different from what from what Emilie and Deb are working on? GRAY: It’s surprising – no pun intended – how similar our strategies are. Our contexts are a bit different. I’m in a suburb about 20 miles from the center of downtown Indianapolis. It’s a rapidly growing area that is seeing cornfields being stripped bare and housing developments going up overnight. People are moving out of inner city Indianapolis, or out of the suburbs of Indianapolis, to go further out so that their kids can go to excellent schools, the school district where I serve, the Brownsburg school district. I’ve been on the job since March, and I have strategically located myself within the community. My primary job has been to create networks and to establish connections within the community. I park myself in Starbucks and other coffee shops as my office, and make appointments with anybody and everybody who will talk to me in the community, so I can get to know the community and its needs. The two primary questions I keep asking are, “Where is God already at work, and how can we join in to the holy work that’s already happening?” Then, “Who’s on the margins that’s not connected to the conversation, but needs to be a part of the conversation?” From those questions I’ve been able to make contact with a core group of about 45 individuals since March 1st that have said, “Put me on your list – I’m interested.” We’re gathering several times a month for social activities but also for service. As a great example we just gathered this past Wednesday at a food pantry. It’s a food pantry that’s run by the school district in Brownsburg – actually a group of high school students run it as part of their special needs class. They offer them life skills preparing the food pantry as if it’s a store. But since they’re on vacation our church has adopted the food pantry for the summer. So we prepare the food pantry for clients the next day, and then from the very same table where we have prepared the food, we celebrate a short Eucharist at the end. So we’re always connecting liturgically what we’re doing in service. The other times were gathering tends to be at pubs, coffee shops, libraries for conversation and spiritual nourishment. But even then we’ve kept as a core rule that every time we gather we will serve in some capacity. So we’ve done things like prepare goodie bags for teachers in an alternative high school in town. We find there is a lot of gravitational pull towards service and outreach. There are several evangelical megachurches in the town, but none of them have opportunities for their members to engage in direct service as part of worship. So it’s something we’ve been designing – worship that’s coupled with service. BRENDAN: But do I understand, Gray, that like Emmaus you don’t really have a regularly scheduled Sunday at 10 worship service? You worship as you gather on service projects. GRAY: Right now we’re gathering to make connections and to serve. We don’t have regularly scheduled Sunday worship yet. One of the new mantras – at least, one of the models we are using for our church plant – is not to offer regular public Sunday worship until we have a strong core built. For me that core number is somewhere between 100 and 200. So our gatherings are more social occasions so that we can build connections with each other. What these women are doing in the Diocese of Arizona is something I’m hoping to replicate in the sense of building up a community – a core that’s gathered so that they can go out and invite their friends and invite others into the community. What they’re doing is really exciting to me and I hope to model that. BRENDAN: We talked with this church in Surprise about this Arizona-Connecticut nexus of funding. How are you approaching the fundraising challenge? GRAY: I’ve been very grateful that’s our diocese has also been equally supportive. When I was seeking to do this church plant, I wrote the bishop a three-page proposal. She was very eager – she shared it with our Diocesan Council and they immediately approved salary funding for me for 3 years. I’ve been very fortunate that I’ve had my salary funded as we get this off the ground. I am seeking our program and ministry dollars right now – collaborations and partnerships with other congregations and with individual donors. I have had some great conversations with several congregations in our diocese about coming on board as what I’m calling equity sponsors. They are offering the lines of equity so when we have costs, we can call upon the sponsoring congregations and they would offer donations in real time. So they get to experience with us as we grow, and as we learn and as we incur costs, rather than just writing a check and sending it off into a black hole and never hearing from us again. BRENDAN: Emilie and Deb, you talked about liturgical worship being a distinguishing feature of what you’re offering in Surprise, and that it’s something the kids that you’re working with in particular responds to. I wonder how that manifests itself. I’m a typical Episcopalian who has never been involved in a church plant. By the time I got around to Nativity Scottsdale it was pretty well established. I’m curious what that experience of worship is like at this early stage. EMILIE: The best way to describe that is to describe what happened at the Grand Canyon. When we first started our youth group, I’ve never seen a group of teenagers gel the way these did. So we knew we needed to take them on retreat immediately to cement that bond they were developing with each other. About four weeks into it we went on retreat to the Grand Canyon. So they’d been up all day – it’s a five hour drive. We got there, we set up tents, they were happy, we went hiking, they ate dinner, they shared their spiritual autobiographies with each other. And then it was about 11:30 or so and we told them they had to go to bed. They said, “No! One more hour for sharing!” We said, “Okay, but then you have to go to bed, because we have to get up at 4 o’clock tomorrow.” And they said, “Why?” Deb wasn’t going to tell them. But then I took pity on them and I told them, “We need to get to the rim of the canyon by Sunrise so that we can celebrate Eucharist.” I cannot describe the way their eyes lit up. They just said, “Oh,” Then there was one more hour of sharing and they all went to bed. Then the next morning, we were still trying to get ready. We were crawling out of our sleeping bags in our pajamas, and the kids were all already in the van, drumming on the windows, saying, “Hurry up! Hurry up! We’re going to miss the sunrise!” But it wasn’t the sunrise they were worried about missing. That Eucharist – it’s hard to tell it’s so windy – but they were so excited about the idea of celebrating Eucharist with each other, in that place, after all of that sharing. It was just incredible. There’s something there that they’re so so hungry for. What’s interesting is that the adult sare too, but they don’t know that they are. And so it’s taking a lot longer for the adults to figure out what we’re about and what we’re trying to do in terms of liturgy and worship. DEB: They also have those moments too, in Bible study and in reflections, and prior to starting the service that we have. But twice now – three times now – they’ve revolted. They wanted to stop the Bible study and get deeper, or stop what we’re doing and plant a church. But clearly they’ll revolt. DEB: The model that we learned at the boot camp did specifically warn against starting regular weekly worship services, but what we found was after about a year, was they were just starving for it – especially the ones on the launch team that didn’t have somewhere else that they worship regularly. GRAY: And I’ve been warned of the same thing. DEB: And I think, too, that, Gray to your point, and our bishop and canon to the ordinary and council – they all supported us the best they could when this came out of the blue. They funded both of us. EMILIE: That’s not how it’s worked in the diocese of Arizona – usually the diocese says, “You need a church…go do that.” The only other person who’s ever walked up to the bishop and said, “I want to plant a church” is Susan Snook. EMILIE: I forget if it was at the conference in Philadelphia, or somewhere else but somebody talked about thinking of church planting in terms of investment in research and development. That’s exactly what we’re all doing. The ones that work, like Nativity, become models for the next people to come along. And the ones that don’t work also become models. To not fund church planting because we’re not sure it’s going to work is self-defeating. Because we won’t find out what works unless we do that initial investment. Some of them will work and some of them won’t. But either way we have information, and that’s what we need right now. And I think, too, putting my priest and youth director hat on for a moment – we need to do the same kind of investing in youth. That’s been missing for a generation if not two in the Episcopal Church, and we’re seeing the results of that in our numbers. People who are over 30 don’t think the church doesn’t care about them – or they assume the church doesn’t care about them because it didn’t care when they were children and teenagers. So we need to put that money now into caring for these children and teenagers who frankly can’t afford a church. Our strongest membership is our youth group. They can’t support us as a church. But we need to invest in them, not for Emmaus, but for the church in general. The only way to have people in the future is to invest in these kids now. DEB: When we first met, Emilie had asked me in regards to the youth group I started at the other church. When I started it the first meeting was two kids and four pizzas. They were very full children by the end of the night. When I left, there was a roster of 75. And she asked out that happened, and I said, “I waited.” We did things, and I loved the kids, but basically I just waited. I waited ten years. I met these kids when they were four and left when they were 14, and they grew into things. And that’s what we need to be doing now – we need to wait for them to grow into adults who will be able to support the church. EMILIE: When she said she didn’t do anything, she did everything, right? Because what she did – as a youth director – developed relationships with four-year-olds, kept those relationships as they became teenagers, and then kept those relationships until they graduated from high school. And that’s what we need to do. Then we need to take the next step and figure out campus ministries, and take the next step and figure out how to support young families. We have to reinvest from the beginning, and not expect any sort of immediate return. DEB: That’s the other thing we did at the very beginning – we took a walk around the block one night and said, “Wait a minute, we’re going to take this to the bishop…what if we fail?” And we had this conversation about, “What if it fails? What if we start something and if fizzles? What if it we try it and it doesn’t work at all?” And what we came to was – the only this is actually a failure is if we don’t try anything. EMILIE: What if we gather people and they all leave? Then we try something else and gather new people. There is no failure. GRAY: The one thing I keep telling myself is that I know that the guaranteed way for nothing to happen is for me to do nothing. That’s such a good place to start. DEB: It seems whenever to get into that mode we get a nice little shove from…afar. EMILIE: The Spirit doesn’t care for stagnation. BRENDAN: We’ve spent a lot of time here talking about investing in who’s going to be the future of our church. Can we get a little more specific about what it is that you’re respective ministries need from the wider church? GRAY: We need prayer. And that’s not just lip service. I think that we would benefit from and would be grateful for a church that is praying for new ministry, for ministry development, for ministry redevelopment – a church that constantly in her intercessions. That is first and foremost what I need from the broader church and what we need in Brownsburg. And then – what I am most hungry for – we’re running this on a shoestring budget and I’m ok with that. But what I would be most grateful for is resources for formation and development for my people, so they know how to co-plant a church with me – the lay leaders who have felt called to do this and are on this journey with me. And I’m hungry for colleagues and companions who are along this journey as well – time and fellowship with those colleagues would be a wonderful gift for me. We’ve had a little bit of that as the church planters gathered in Philadelphia this past April with Tom Brackett who heads this up at the national Episcopal Church, and I’m grateful to have these connections with folks like Deb and Emilie who are doing this kind of work in the field along with me. EMILIE: I think too that idea of research and development is real. We are starting churches in areas that don’t understand The Episcopal Church in general, and then with demographics such as youth who don’t understand church in general. We do need financial support for programs like youth ministry that don’t support themselves in areas like Surprise where there isn’t an established Episcopal congregation that can decide to fund youth ministry. Our youth group really does run on a shoestring budget. EMILIE: That idea of the way people used to invest in foreign missions – I think we need figure out how to insert that in a new way into the culture of our established congregations – “Part of what we as an established congregation is donate money to people who are out in the mission field” – not somewhere across the ocean but out in the mission field in the suburbs somewhere a new church or doing youth ministry, or working with marginalized groups who can’t support themselves. BRENDAN: I’m curious, before we close, is there any question that you wish I had asked? I go to a pretty well-established church and there may be things that aren’t even on my radar that are important to you. DEB: I think I would just say that the way Emmaus came into being – thinking back to my home parish in Connecticut with about 15 people in it – I love them dearly. What I heard in visiting recently was such excitement for what’s going on here in Surprise. And they’re telling me that their church was dying. And quite literally it is; the congregation is aging. What they didn’t acknowledge – whether they see it or not – was the actual intangible presence of the Spirit that is still there with them. But they see it here. And I think acknowledging that and looking at what each of those ministries is being called to do, and they’re so very different. I think that plays into the first thought we had of each ministry looking different, and there not being a clear cut, single model for church planting. We have to look at what that movement is in any given moment in any given community. EMILIE: The Holy Spirit is real. Anybody who does this kind of work – this sort of missional church planting work – is going to feel that shove. Whether you got into it because you were appointed to be a church planter somewhere and you had to go figure out who to do it, or whether like us you were just pushed into it from the beginning, the Spirit is out there waiting to move people who put themselves out there. That’s one of the things that is really exciting, that we can take back to the broader, wider church. Out here on the margins the Spirit is actively doing things, and doing really exciting things in really exciting ways. But we’re also doing work of the Holy Spirit, so it’s not going to look like what we might expect it to look like. And at times it’s just plain scary, but that’s what’s going on. That the message that I would want to give – it’s real. It’s real. DEB: And it’s real and tangible in the same way it was 2,000 years ago. And it’s not safe and it’s not pretty. In the context of our society it’s not unsafe either, which I think makes it more of a challenge. But at the same time it’s so valuable, and absolutely tangibly real. GRAY: Brendan, something that I get asked often is, “How can I, in my established parish that has Sunday worship with a beautiful building, be a part of this movement?” Of course we’re grateful for support out on the margins as well. But this morning I was preaching at an established parish here in Indianapolis, and we had this conversation at the forum. I asked them to pretend that they were planting their church for the first time in their neighborhood. What would they do differently? How would they get out of their building? I’m mindful of the “three practices” movement that’s emerging as we get ready for General Convention – one of them is the need to travel lightly. If I have any piece of advice for an existing parish after having served in parishes for almost 12 years, it’s to get out of the building and to get into the community – to see the community again with new eyes. Be present and minister with your community outside your building as much as you can. Not to discount the building – but it helps you to use the building as a resource in ways you might not have thought of to begin with. BRENDAN: Gray, I didn’t tell you this, but I’ve been paying attention to some of the things you’ve been saying, and as a little baby step in that direction, when our stewardship committee had our first meeting of the year a few weeks ago, we deliberately met elsewhere in the neighborhood as a result of exactly what you’re seeing. GRAY: It helps you to see your community with new eyes if nothing else. That’s the worst case scenario. The best case scenario is you might meet a newcomer who wants to be part of your community. Previous PostBLOGFORCE challenge extended!Next PostBLOGFORCE Roundup – Where is Galilee for you?